Make your reports get noticed! See-through vinyl covers enhance every presentation. 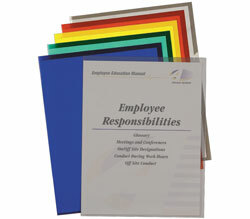 Assorted colored covers with 1/8 inch white binding bars (backbones). Assortment includes 10 each of green, red, blue, yellow and clear. Hold 8 1/2 x 11 materials. 50/BX.